Mall Santas are a traditional part of December. Do you remember the magic from your childhood? We can learn many lessons from them. Sacrifice: Parents (grandparents) will stand in line for ages for their kids (grandkids). Free: People will stand in line for a small, free candy cane. Disguise: Mall Santas wear costumes which cover up who they really are. Fright: Mall Santas scare some small children (clowns do too). Disbelief: How can Santa be in different malls and look slightly different in them? Belief: Children want to believe that Santa hears their wishes and will bring them a pony. Priorities: Shouldn’t Santa be at the North Pole getting ready for the big night? Impressionable: Children want to believe in Santa even when they’re skeptical. Cutbacks: The candy canes have become smaller over the years. Dentists may approve but children do not. Vanish: If the requested gifts don’t arrive, the Mall Santa is gone. Scarcity: Mall Santas have limited working hours and working days. Gouging: Photos with Mall Santas used to be free if you used your own camera. Job Security: Mall Santas are easy to replace. Appearance: Mall Santas show that a rolly polly figure can be an asset. Monotony: There’s lots of repetition in listing to gift requests and giving out candy canes. Impersonal: Visitors don’t get much time with Santa. Next. Off-season: Mall Santas have a very short work season (unlike the team at the North Pole). One-sided: Who asks what the Mall Santa wants? Supervision: Mall Santas are trusted with gift wishes but not enough to be left alone with the children. Breaks: Mall Santas can’t take a coffee break whenever they want. Noncommittal: Mall Santas don’t guarantee that the requested gifts will be delivered (but the real Santa doesn’t either). Naivety: Mall Santas tend to satisfy young kids … the older ones want a candy cane or mischief. Consumerism: Mall Santas are better with the gifts that money can buy (and which the mall sells). This is the final post of 2013. May 2014 be the best year you've seen! The podcasts have ended. You’ll find 250 episodes at podcast.riscario.com. You can't hear snow fall. You might not see the flurries accumulate if you’re asleep or away from a window. Where did all the snow come from? More important, how do you clear the deluge? The tax-funded snow plows clear the streets, though perhaps not as quickly as you’d like. You’re left to tackle your own driveway and walkway with your shovel or snow blower. You’re left to tackle your finances too. the first light snow fall: where are the scarf, boots and ice scraper? the first snow storm: where’s the shovel and ice melter? the first cold spell: where’s the extra warm winter gear? Have you put a shovel in your car? Do you have enough ice melter? Is there fuel for the snow blower and does it start? Did you get your furnace inspected? We get surprised by our finances too. Do you know where everything is when you need it? Are we on track with our goals? Do we require an inspection or maintenance? It’s easier to think we’re prepared than to prepare. Meteorologists want to give accurate forecasts but we can’t rely on them even if your favorite station has a weather guarantee. Storms get missed or become more severe than predicted. Other storms are milder, if they even occur. Financial forecasts are inaccurate but advisors often find plausible reasons for you to entrust more of your money with them. If investment returns are high, we’re encouraged to invest more to take advantage. If the returns are poor, we’re also encouraged to invest more to offset the poor performance and be ready for future growth. We were expecting 12 to 20 cm of snow overnight. Since I needed to register for a yoga class at 6:30 AM (not a typo), I got fuel for the snow blower. Nothing happened. Now the forecasters predict 6-12 cm in total. They’re probably right. I’ve already shoveled once. Maybe the snow blower will get a workout after all. You can hire a snow plow service for the season but you can’t be sure if they’ll be there when you need them. Their profits go down when they provide more service (i.e., when snow falls). Even with the best of intentions, they can’t plow all driveways at the same time or the right time. Financial advice is similar. Unless advisors charge fees for their advice, they make more when they provide less service. They make more when you invest more and as your investments grow if they charge based on the assets they invest for you. Their expenses pile up even if your assets melt. Is your life insurance like a shovel or snow blower? PS When I wanted to use my snow brush, I found it wasn’t in the vehicle. My parents gave me a copy of The Wealthy Barber around the time I started working. I couldn’t read it. The story got in the way. Besides, there’s wisdom everywhere if we’re willing to listen. Why place more credence on what a celebrity says? We can learn from a real barber and other people we know and meet. David Chilton wrote The Wealthy Barber Returns, which dispenses with the barber. I bought the book shortly after its release and deferred reading it until now. I wish I hadn’t delayed. The new book is well worth reading. David has a deep understanding of the financial world. More important, he understands the irrational ways we behave. Most important, he’s funny. Very funny. What a powerful and useful combination. This post features selected experts from the book. One of the biggest reasons that it’s so difficult to save is that … almost everyone wants you to spend as much as possible … our instant-gratification-oriented minds aren’t putting up much resistance … There are really only three Canadians who want you to set aside some money — your future you, your financial advisor and me. A new study from the US government’s Consumer Financial Protection Bureau (CFPB) finds that 25 times more is spent on financial marketing than financial education. In the US, that’s about $17 billion on marketing versus $0.7 billion on education. If the marketing didn’t work, would the companies spend the money? Unfortunately, the financial sector is the least trusted in the world according this year’s Edelman Trust Barometer. What’s good for the industry is bad for us. Education and changes in behaviour are the antidotes. It’s hard to overstate the impact our “reference groups” have on our spending decisions. We consciously and unconsciously take in their consumption cues. Their lifestyles intoxicate us and when partnered with the great enabler — easy credit — lead us to act richer than we are, “act” obviously being the key word. He’s right but can you resist? I prefer the terminology “I choose not to” because there are things I can afford but which aren’t good value. I don’t often say this out loud but think it to myself. As a vegetarian, eating out has a lousy ROI when the bill is split evenly. Buffets are the same way. My next one is $26 per person plus beverages. There’s no way to get my money’s worth (without gaining weight). "I phoned the loan officer. I asked him, point-blank, why he gave a huge line of credit to a customer who hadn’t requested it and who had admitted that she has a significant spending issue. His answer was succinct, honest and illuminating. “It’s my job,” he said. Banks are a business and, like all businesses, they sell something … it’s no longer only about providing credit to those who need it, now it’s also about convincing people they should want it. That young loan officer had a true conflict of interest … what was best for the client and what was best for his employer weren’t aligned. He went with the paycheque and it’s hard to blame him. Too few realize that they receive financial advice which doesn’t put their interests first. More financial education would help. To outperform the market’s return, you have to outperform the majority of others who are also trying to outperform the market’s return … When you hand over your hard-earned savings to a professional money manager you deem smarter than yourself, be careful … it’s irrelevant if he or she is smarter than you. Instead, what matters is whether he or she is smarter than most of the other people who are smarter than you … we can’t all outperform. We need a bunch of underperformers to balance the scale. What Are You Paying Your Advisor? The financial-advice business must be the only business in the world where most customers aren’t told what they’ve received or how much they’ve paid for it. Performance and costs matter. But to evaluate them, you need to know them. Do you ask what you’re paying? Do you get value for what you’re paying? If not, consider other options. If you need help understanding, consider hiring an independent fee-only advisor. David leaves us with hope. Over the next few years, the costs of financial products and financial advice are going to go down significantly. Competition is heating up and consumers are becoming better educated — a powerful combination. You don’t have to wait. Get better educated today. Do advisors put their interests first? What does your advisor drive? PS If you already have The Wealthy Barber Returns, maybe it’s time to re-read it? ‘Tis the season to shop. Retailers always find reasons for us to spend our money. Since when did Santa mean shopping? He symbolizes giving. Rather than give something we bought, we can give something more precious: ourselves. If you must shop, here are 12 timeless tips. For examples, we’ll use gadgets rather than items like clothing. If you’re prone to saying “I’ll know it when I see it”, you risk spending lots of time shopping. You also risk overspending. Think about what you want first. You can still browse, but now you have a Plan A. If you like wandering around, you could go for a walk. If you don’t have a sense for the normal prices, you can’t tell if you’re really getting a deal. Sales may be based on prices that few would pay. Items may be cheaper when major sales aren’t taking place. Over the years, I’ve noticed (and this is unscientific) that highend computers tend to be cheaper in late November and early December than just after Christmas. There are sales every week, but the deals vary. You might notice patterns too. If you’re patient, you can win. The screenshot shows a Black Friday deal from Dell. On the surface, the deal looks good: a $90 hard drive for $50. I was tempted but looked closer. Does Dell even make hard drives? My Dell computer has disk drives from WD and Samsung. Since no one else sells Dell hard drives, they can set any price they want. The $90 is a “market price”, which is a fictitious. Even so, the offer looks good. However, the product page doesn’t show the warranty. In contrast, Costco sells a WD My Passport Ultra hard drive with a three year warranty and carrying case for $90 (1 TB) or $129 (2 TB). Maybe that’s a better deal for peace of mind? The Simpsons were once looking for a new TV and kept driving further away to get the best deals. 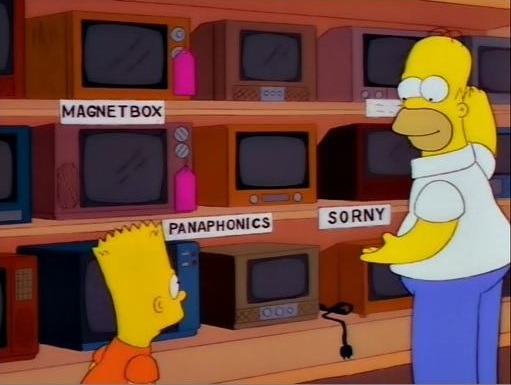 They saw brands like Sorny, Panaphonics and Magnetbox. Some buyers might get fooled by these seemingly familiar brands. Comparing features and specifications isn’t enough either. What matches or wins on paper may not be a good choice. For instance, the tablet may have short battery life or an unresponsive touch screen. Flexibility makes shopping easier. There will likely be something on sale when you’re ready to buy. Some items go on sale at specific times of year. For instance, anti-virus software is always on sale on Boxing Day. I don’t know why. A three-user Kaspersky Internet Security suite drops from $80 to $20 at Best Buy. Since the licence lasts a year, this is an annual must-buy item. You might buy on impulse. That’s fine. We’re human. You don’t have to open the product immediately. Wait a day or more. Do you still feel compelled to keep it? If not, return your purchase. This happens to us at Costco where the products keep changing and the return policies are fair. Shop where you can return purchases easily, without paying for shipping/restocking. I’m reluctant to buy online unless the retailer has physical stores for returns. Sorry Amazon. Especially sorry to smaller retailers (even with physical stores). Suppose you bought the hard drive from Dell and decided you didn’t like it. You can return it without cost or penalty. If you’re comfortable buying fewer items, you’ll have less clutter. The environment will thank you too. Quality costs more but what you get is often more enjoyable. I’m still using my iPad 1, which is still working fine. Is last year’s model that bad? Everything becomes old. You might save more by getting last year’s proven model. With gadgets, it’s tempting to get the latest because newer is often better. That’s not true for products like toaster ovens where the changes may be cosmetic. Another option is to get a refurbished model with a full manufacturer’s warranty. Shopping consumes mental energy. Less choice can be better. For instance, Costco has a limited selection, which is fine. As an example, you can get hard drives in multiple colours but Costco only stocks black. Does that really matter? We live in the world of buyer beware. We also live in a world where we don’t have to buy. Our basic needs are limited. Buying a video camera: can we trust the experts? PS Just because you have money to spend doesn’t mean you have to spend the money. Let’s dream. Imagine retiring early with nary a financial worry. What's the magic age? We’ll explore 35, 55 and 75. Julian: I’ve got a plan, all right. It’s called a Freedom 35. Bubbles: What’s a Freedom 35? Ricky: You’re not going to believe. This is perfect. Julian’s got these guards on the inside that are going to smuggle in a bunch of dope that we grow, sell it for big money in there and then we can retire and never have to break the law again. This early retirement plan is from the Trailer Park Boys (Season 2, Episode 1). Not recommended. Very few can afford to retire at 35. Suppose you could. What would you do with the rest of your life even if you live outside a trailer park? I never quite understood the Freedom 55 ad campaign by London Life in the 1980s. The idea seems to be buying their products (perhaps whole life insurance) would magically to build up enough savings to let you retire at age 55. To paraphrase Bruce Springsteen, a dream that doesn’t come true is a lie … or something worse. Was early retirement possible for typical buyers? Who really retired? Probably the advisors --- on money they made from selling the products. I grew up in London, Ontario where London Life was headquartered. At Western University, I was taught by actuaries from there and received The London Life Continuing Actuarial Scholarship. I wanted to believe the dream. When you're in your 20s and 30s, age 55 seems so far away. Being able to retire at 55 had appeal and might have been achievable with a good job and a defined benefit pension plan. Now people in their 50s plan to keep working after they retire in their 60s, often to supplement their income (Huffington Post, Aug 2012). Retirement ages look like they’re getting closer to 75 than 55. We're living longer than ever. That means our money must last longer. Even if we're saving enough based on rosy projections, the investment returns may not materialize. Well-paying jobs aren’t secure. Also, we face unpredictable expenses such as health costs. We don't know what the government can afford to provide for us or for how long. Consider the case of Tom Palone, who was a VP at Oral-B earning over $100,000 a year. Now 77, he works two physically-demanding part-time jobs paying $10/hour or less. He says, “I earn in a week what I used to earn in an hour” (Daily Mail, Sep 2013). Where does that leave us? We might have children but there's no assurance they'll care for us physically or financially even if they can. Maybe you can keep working part-time if you’re healthy. Besides earning money, you'll have things to do. Decades of retirement can feel like a job too. You can get financial projections that show how much you need to save to achieve a particular level of savings by a target age. Unfortunately, higher risk accompanies higher projected returns. Life insurance is sometimes proposed as a savings vehicle since growth is tax sheltered as in an RRSP. Withdrawals are taxable but you can access the savings via tax-free loans. This assumes that you're comfortable carrying debt when you're retired. Even if you think you are, you may find that you really aren't. If you're borrowing against the collateral in your policy, the interest rates aren't predictable. Insurers provide guaranteed lifetime income via life annuities. The payments are determined at the time you buy, based on your projected remaining lifetime and projected interest rates. Since we're living longer and investment returns are currently low, the annuity income looks less attractive. To get a better understanding of your financial situation, get an independent review by a fee-only financial planner who doesn’t sell any products or get any referral fees from product sellers. Fee-only planners vary in what they charge, ranging from hundreds to thousands. They may save you much more than that through lower cost investments and higher peace of mind. You can get "free" advice from several advisors who sell investments or insurance, or claim to do real financial planning. You may have trouble figuring out the advisor's biases but don't be surprised if they recommend you buy more of something they sell. The investigation process is time consuming and the proposals may not be clear. A fee-only planner can help with the review and inform you of the options left out. Whatever your target age, make sure you’re planning financial freedom for you, not your advisor. PS Financial freedom means little without health. Sometimes the cause and lesson are clear. Other times we make shaky connections. Either way, what steps do we take to avoid getting sick again? We visited the only Corvette factory (worth seeing) and ended up in a Kentucky hospital (worth skipping). We probably got food poisoning from a local restaurant. In school, I got strep throat as often as once a year. I thought that was punishment for eating candy. Recently, I had a painful tummy. After eating, I felt gassy and bloated. My stomach hurt while digesting the food. I thought the cause was eating at a restaurant but no one else in my family got sick. The only difference in our meals was that I had hot soup. Does this sound familiar? You're busy. You're not eating well, exercising or sleeping enough. You've got deadlines! You've got no time. You've certainly got no time to get sick. Your body doesn't care and forces you to bed. Now you have time. Your priorities changed. The world continues functioning without you. That's humbling. While sick, we're often forced to listen and change the way we behave --- at least temporarily. Afterwards, what happens? Do we continue to apply the lessons or do we go back to our old ways? There's little value in failing and getting forced to learn the same lesson again. And maybe again. During my tummy troubles, I ate smaller portions more frequently. The food was healthier, fresher and more alkaline. More salad. More vegetables. Less wheat. Some nuts like almonds. Fewer ingredients and condiments. Almost no processed food like cereals or protein bars. Very little added sugar. More walking (almost daily). More rest. I also got Ki Therapy from Julian Hirabiyashi (who I highly recommend). I've recovered and don't want to get sick again. I’ve continued behaving well for weeks. Maybe that will last. We may be wrong about why we got sick but we can use the experience as a nudge to change the way we behave. Learning from sickness is healthy. PS The time we need a break is when we don't have time for a break. Enjoy the weekend! Would Walter have turned to crime if he had the right insurance in place? Good people get bad breaks. Walter never smoked but he got lung cancer anyway. By the time of detection, the cancer was considered untreatable. Were there no signs earlier? Walter shows many of the symptoms. There are precautions to offset the financial costs of disease. Walter was covered by an HMO (Health Maintenance Organization). That's a US-style of cost containment with unfortunate side effects. The premise is good: treating conditions early is simpler, faster and cheaper than waiting until later. The HMO get fixed revenue per subscriber, which provides an incentive to tame costs. Members have financial incentives to stay healthy too. Their out-of-pocket expenses (if any) are lower for basic preventative care than for specialized care. The HMO (which could be run for-profit) makes more by providing less. That's not the same as keeping people healthy. For instance, having too few doctors means a greater workload and an incentive to spend less time with each patient. Walter experiences the drawbacks. His pricey chemotherapy isn't covered. In Season 2, a $13,000 hospital stay isn’t either. There’s a difference between an MRI which is diagnostic vs exploratory --- even when ordered by a doctor. Walter got the one that was excluded. Does that seem fair? Another cost is waiting time. Perhaps the best doctors don’t want to work in an HMO where they’re often on salary. Doesn't the Canadian healthcare system feel similar? We also have waiting times, limited choice and limited coverage. A friend who is currently undergoing cancer treatment is getting injections which cost $3,000 each. Private health insurance covers 75%, which means an out-of-pocket expense of $750 each time. Income replacement insurance helps replace your income if you're unable to work after a waiting period. The definitions and benefits vary. You might not be able to work during treatment or be able to return to work afterwards. The bills keep coming in even if the income doesn’t. Employers might provide income during short absences. Perhaps full pay for X days and then a reduction until the long term disability benefits start. The self-employed may not even have that cushion. This coverage typically pays a lump sum a month after the diagnosis of a covered life threatening condition like cancer, heart attack or a stroke. The money can be used any way you want. Walter could have used the benefits to replace income until the disability insurance benefits start, pay off debt and/or get the hot water heater fixed. A hot bath can be therapeutic. Do you see the flaws in the planning? There's no provision for unexpected expenses. There’s a bigger problem. What happens after 10 years? Walter’s wife Skyler is then 50. Is she to go to work then? She isn’t trained in Walt’s lucrative side business. Maybe Walter expects Skyler to find other sources of income such as from her writing or selling items on eBay. Walter has been seriously underemployed. While teaching, he worked part time at a car wash. Also, teachers get two months of summer vacation. Given his intelligence and resourcefulness, what was holding him back? More money would have provided a better standard of living and covered the insurance premiums. His impending death brought him to life but that was too late. Insurance looks like an expense but provides peace of mind. Insurance could be the best investment ever when purchased through the right advisor and insurers. The underwriting process may have detected the cancer early enough for treatment. That would have been a good break (though boring TV). Case study: what to do when your term 10 rates are about to spike? PS If you rent your hot water heater, you avoid a capital outlay and have your repairs covered. That’s insurance too. Before gobbling the bounty from your trick-or-treating, don't you first check the loot and throw out questionable items like apples? Financial information is even scarier than Halloween. You might get the wrong information and be worse off. Your sources could be in costume, hiding their true identities. November is Financial Literacy Month and anyone can create an event. That doesn’t make them worth your time. Journalists and credible bloggers pre-screen events which are worth your attention. The Financial Consumer Agency of Canada (FCAC) lists events across the country. The calendar is worth a peek because of their screening process. Activity to create awareness on the importance of Financial Literacy/Financial Education. These criteria are sound and well-considered. The events listed generally look safe. Avoid events with commercial sponsorship. What are they expecting in return? The money might influence the content delivered or the speakers selected. You’re less likely to hear independent voices. Be wary of free events. Space and refreshments cost money. What’s the catch? You’re safest when the sponsorship comes from noncommercial sources (though they have less money available). For instance, you needn’t worry about Ellen’s workshop, which is supported by the FCAC, the Investor Education Fund and Ryerson University. Avoid celebrities who don't blog or publish content regularly. They might keep reusing content which is becoming increasingly stale. I saw one author six times. The world changed over the years but the presentation didn’t --- not even the jokes. Yet there was no time for a blog. Content creators often have fresh things to say (and rarely mind getting recorded). To which groups and associations do you belong? Which financial institutions have your money? Which advisors do you heed? They already have relationships with you. Where are their financial literacy events? How good are they? The general lack of financial literacy is scary. So too is skewed or incomplete information. If you're not getting solid, objective advice in a form you understand, find other sources. After careful screening. Does your advisor help with your financial literacy? PS Choose multiple sources for different perspectives. This short video explores the effects of sugar around the world. We pay for excessive sugar consumption with our own health and as a society. The manufacturers are tough to blame. Information about sugar is easily available online. They don’t force us to buy (but entice us as much as possible). They don't tell us how much to consume (but their packaging influences us). Depending on your age, you may recall that soft drinks in Canada came in 10 ounce tough-to-crush steel cans. After the switch to the 12 ounce aluminum cans used in the US, we didn’t throw out the extra two ounces. That would be wasteful. Instead, we quickly learned to consume more. Children did too. While normal sugar may be bad, artificial sweeteners and high fructose corn syrup look even worse. Also manufacturers also play games with their labeling. To avoid showing sugar as the first or second item, the label, they may show different forms of sugar (e.g., brown sugar, molasses, concentrated fruit juice, dried cane sugar, hydrolysed starch, dextrose, maize syrup, honey). Sneaky, even for people who read the labels. We care about the amount of sugar, not the subdivisions designed to deceive. Here are five ways to reduce your consumption of sugar. You can't take sugar out of your dessert but you can take a smaller portion (no seconds!) or eat less frequently. You can share too. Sometimes we’ll pour a can of pop into two small glasses. We're used to adding sugar to foods such as coffee and tea. We might add hot fudge to our ice cream or sugar to our cereal. We may have ice cream with our apple pie or apple pie with our ice cream. We can cut back and perhaps eliminate some of the extra sweetness. Since you can't eat what you don't have, a simple solution is to avoid buying sugary processed food. If you wouldn't buy a product at normal price, should you buy because it's on sale and you're "saving" money? In the quest for profits, companies switch to ever-cheaper ingredients with names we can't easily pronounce. Products with better ingredients usually cost more. Buy them and you're paying a tax for quality. That's a financial incentive to buy less, eat less and savour each bite. Depending on your skills, you could even occasionally make treats at home. You’ll know how much sugar you're using, which can be disturbing. When you exercise regularly, you want results. Eating better helps. That means less sugar and likely less cravings for the wrong things. Besides, you have less time to eat. Sugar has been called “addictive and the most dangerous drug of the times”. Oreos are as addictive as cocaine for rats, according to a flawed study. Rather than argue over the headlines, let’s live better. Where there’s willpower, there’s a way. What sugar do you consume daily? How can you cut back before your doctor tells you? Like teens, advisors want to look independent but may not be. Advisors who aren’t independent are called “captive” (Investopedia). They are dependent and forced to sell products from a specific catalogue or specific companies. They can't scan the market. Management influences what they sell through quotas and bonuses. Somehow, the captives convince themselves they have freedom of choice. They convince themselves that what they have is the best (or at least good enough). They then try to convince you. You don't go to the Apple Store for unbiased advice about Apple or Android. At least you know that. With financial advice, the limitations aren't as obvious. Captive advisors are like commissioned employees. They're stuck selling what they're told to sell, regardless of quality or value. Dependent advisors don't have their own brands. Their business cards show the name of the company they represent. Dependent advisors rarely have their own websites. Instead, they may have a page on a corporate website that lists competitors (other advisors from the very same firm). What about social networking? Since captive advisors are representatives of a brand, they may not be allowed to use social media. It’s as if the brand doesn’t trust the judgement of their own employees. Captive advisors might be on LinkedIn but have an especially bland profile due to corporate standards. Following the rules is called “compliance”. They may belong to Groups, but do they participate? If you connect to a captive, don't be surprised if they block their connections from your view. Actually, that could easily be true for independent advisors too. An article from a captive advisor may have been ghostwritten by the corporate head office or approved there. You can often tell by the blandness and wishywashy-ness of the content. The writing rarely sounds like the advisor. There's rarely any personality or a controversial stance. Do a web search for an article title and see what shows up. You might find the same article but with different author names. 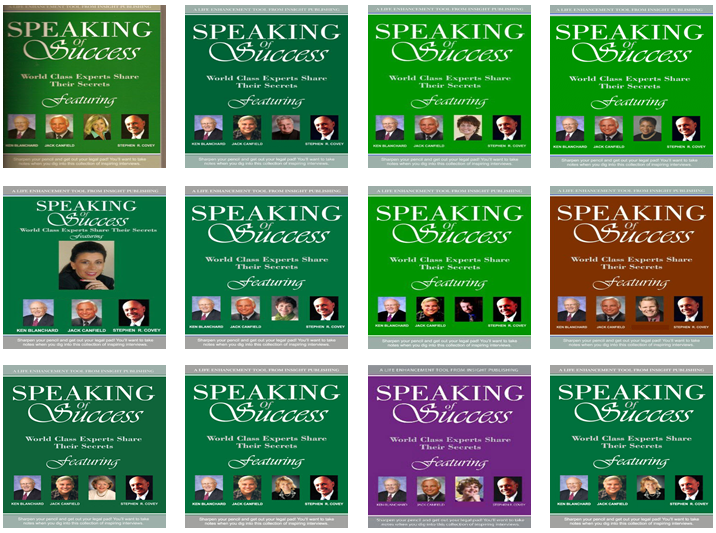 That even happens with books like Speaking Of Success written by Ken Blanchard, Jack Canfield, Stephen Covey and (fill in the blank) . Actually, independent advisors can play this game too. Independent advisors can scan the marketplace. That choice might be an illusion. In practice, they often have preferred suppliers which get the bulk of their business. The products they sell might cost less or guarantee more. A captive advisor can't offer you much choice. That may seem like an advantage because choice can paralyze. An independent advisor can scan the marketplace and filter the choices for you. Mommy, where do independent advisors come from? They often started as captives to get training. The top ones often leave after they’re trained and established. Why? Independents tend to get paid more. Also, independents tend to get better service because vendors are competing for their business. If you're young, your needs tend to be simpler. The difference between captive and independent matters less. By the time you need choice, you've established a relationship with your advisor and your advisor has developed more sales skills. You're less likely to leave or realize what you are (not) getting. You risk becoming the captive, caged by a Goliath. PS Just because an advisor is paid on commission doesn't make them independent. Once you understand that Goliath is much weaker than you think he is, and David has superior technology, then you say: why do we tell the story the way we do? Do you remember the tale of David and Goliath? That’s the title of Malcolm Gladwell’s new book. He shared his interpretation at TED@250. There are lessons for you and your money. The financial sector is huge, powerful and the least trusted in the world. We're still recovering from the harm caused by the 2008 financial meltdown. There are lots of examples of misdeeds in Pound Foolish (Helaine Olen), Fight Back (Ellen Roseman) and @trustandyou. David took a stand against Goliath in hand-to-hand combat when all others cowered with fear. The match looked unfair. Goliath had size, strength, experience and armor. David didn't. In a conventional battle, Goliath had the clear advantage. David changed those strengths into weaknesses. He turned his own speed and nimbleness into advantages. He used his slingshot to down Goliath from a safe distance. The battle was unfair ... to Goliath. You are nimble. You have a weapon more powerful than sticks, stones and slingshots. You have social media. You have access to the world from your smartphone wherever you go (though mind the roaming rates!). You can attack Goliath anytime you see misconduct using text, photos, audio or video. Goliath has trouble responding in a quick, caring and believable way. Employees are often restricted or prevented from using social media. For instance, Air Canada lost a dog and internally planned to “just ignore” the media attention, hoping the story would fade away (like RBC-iGate did). David fought alone. Your weapon is even more powerful because you can mobilize others. Even total strangers can help as your word spreads. Thanks hashtags, retweets, Likes and +1s. Unless you take action, you help Goliath grow stronger. You must give incentives to force change. You must be willing to move your business. You might even need to admit that you made mistakes. Rogers gave mobile customers a credit for the latest service outage (perhaps worth $18 million). This seems to be a first. Apple reversed a decision to leave a rating system which measures the environmental impact of their products. There's less need to fear Goliath. We're connected. We’re stronger. We’re more resourceful. We vote with our wallets and feet. We're winning … unless we stay silent. One of the best ways to keep earning is to keep learning. Maybe the solution is the Netflix “all-you-can-eat-for-low-monthly-fee” approach. We've had Netflix since the launch in Canada (no cable or satellite TV). We get great value for our $8 a month. Thanks to fast unlimited internet, we don't have to worry about bandwidth considerations. Netflix works because of the large selection and low price. Thanks to Canadian innovations MoreFlicks and Unblock US, we can access Netflix titles from other countries. How can you not get your money’s worth? This same model may not work for other services. We can learn by reading and listening. Here are ways. Next Issue (US, Canada) gives you unlimited access to all issues of 100+ magazines for $15 a month. This might sound like a great deal but is it? You can certainly browse many titles. Would you? There is already so much content available online for free. You already get a personalized magazine-like feel with services like Google Currents, Flipboard, Vu and Zite. When you’re looking for something, it’s much easier to do a web search than to go to the magazine’s website. I’m more interested in the article than the publication. I like looking at different sources, including blogs. How much do you spend on magazines today? For us it's about $50 a year. With Next Issue, the price jumps to $180 a year. We'd be spending much more than we currently do. Why? It’s not as if we have hours of extra time for the extra reading. Does Next Issue look appealing to you? I’d rather spend the money upgrading my mobile data plan. If you read books, you can easily spend hundreds of dollars a year. And get stuck with titles that simply aren't very good. No refund. A flat fee subscription has appeal. You get to browse without penalty. Since the publishers get paid based on how much of a book you read, they bear the risk for lousy content. The Kindle Owners’ Lending Library has 350,000 titles as part of Amazon Prime for $79/year. There are two new options with 100,000 titles: Oyster ($10/month) and Scribd ($9/month). These choices are US-only at the moment. Not all publishers are participating, which limits the selection. As with Netflix, you won't get the newest releases until later. That's fine with me because I've already got too much to read. I’m a big fan of listening to books but there’s no all-you-can listen service now that audiobooks.com switched to the unsatisfying Audible model of a title per month. Their price of $25/month looks too high. You can skim books but not audiobooks. A lower price makes sense. Why should audiobooks cost more than magazines? Why should magazines cost more than ebooks? Why should they all cost more than Netflix? I'd love to see a service which offers both ebooks and audiobooks for a reasonable price. I like listening while commuting and having the ebook for making notes. Given the pace of innovation (or copying Netflix) that may happen soon. PS For a free “Netflix for learning”, visit your public library in person or online. Picture this. It’s a cold, dark and stormy night. Do you go to a personal finance event or stay home? Now picture a bright, warm sunny day. Do you go to a personal finance event or go out? Personal finance is important but not much of a draw, regardless of the weather. We often know what to do … but don’t. November is Financial Literacy Month. Money 50/50 is a proposal for a perfect live interactive event that can be replicated across the country. What would get you to leave your cozy home? How about “celebrity” speakers who aren’t selling financial services. Some personal finance bloggers and journalists are ideal. They are transparent and credible. They publish continually, answer questions and genuinely care. You might want to meet them. There’s also an advantage for the organizer: these speakers already have audiences, which helps fill seats with less effort. While you may attend because of the speakers, the content also matters. There isn’t much new to say about personal finance but we all need reminding. The discussion is the most valuable part. Unless there’s real interaction, the speakers could save their time and yours by posting videos on YouTube. The short segments allow more speakers. If you’re not interested in one, that’s fine because they’ll be off stage soon. You may find you benefit most from who you didn’t want to see. You get time to network and ask questions before, during and after the program. Money 50/50 could take place after work (say downtown at 5:30 PM) or after dinner (say at 7:00 PM). Each speaker deserves a prime spot since they’re volunteering their time to speak for free. Since we remember who’s first and last, this structure eliminates the middle: Speaker 1, Speaker 2, Break, Speaker 3, Speaker 4. Change takes time. Financial bloggers and journalists are here to help. You can read their classic content anytime and get their latest thinking by subscribing to their blogs. You can follow them on Twitter. You can ask questions on Facebook and Google Plus (if they’re there). These might be willing to endorse Money 50/50 or at least promote via social media. If there are suitable paying sponsors, Money 50/50 can have freebies like refreshments, pens, paper and prizes. It’s important that the sponsors have no influence over the selection of speakers or topics. The first step is finding a venue and locking in the date well in advance. For Money 50/50, that means finding a free place. If the room is free, the event can be free (or cheaper). When the venue has a price tag, there’s the added stress of filling seats. Charging admission may deter you from attending (though paying often increases the likelihood you’ll show up). The ideal room has tables, a whiteboard, a screen and a projector. A lecture hall with theatre-style elevated seating could be ideal. Depending on the size, microphones might be useful. How would you make Money 50/50 better? What would cause you to attend and bring a friend? Please leave your comments below. I’m willing to organize a Money 50/50 event in Toronto if I can find a free venue. Any suggestions? PS Financial literacy events can take place all year long and I’m willing to help.